Another fun AMG wallpaper in Alphonse Mucha Art Nouveau style. 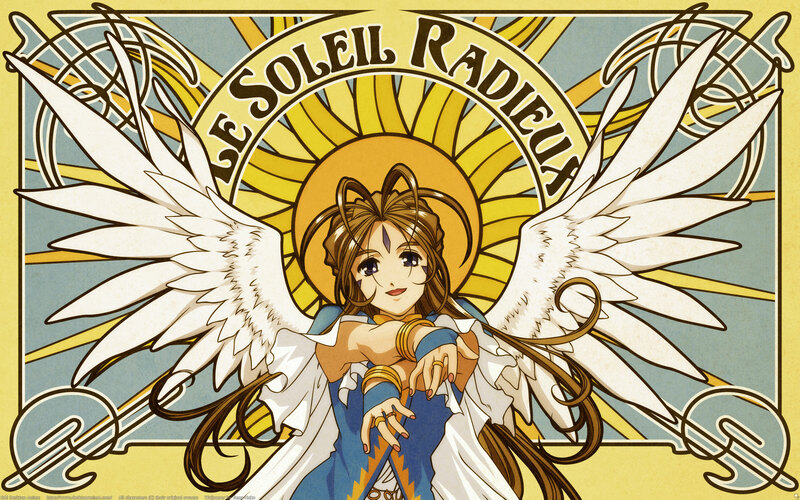 I liked the curve of Belldandy's wings in the original scan, and figured I could use in a Nouveau-style framing with a sun-in-glory complementing the arc of her wings. So I did just that. Corner framing is based off of Mucha's "Cherry Blossom" artwork. Blues and golds to complement Belldandy's costume. Texturing for that classic lithograph feel. Hopefully, Google Translate is up to snuff for this title, which should be "The Radiant Sun" in French. OMG, I just love this! I just love the boldness and the color is wonderful! This is going to be my wallpaper right away! Love the bold outlines, the colors are awesome and the idea is just super-neat! Great job! This has got to be my fav art-nouveau wall from you, it's dynamic and well-balanced, the blues and golds look so good together and it has buckets of charm. Excellent concept here. Nice bold outlines displayed. In my opinion, Belldandy makes the sun feel even warmer with her happiness. A must for any rainy day! The bold outlines are pure love. The typography is also wonderful! Awesome stuff, love the bold lines. I love how the bold colors look like stained glass. great scan & resource selection, greatly put together. I adore this style of work! Having pretty much always loved Art Nouveau, I must say I love the design and composition there. The background is simply amazing and matches with the clean and beautiful scan very well. Great effort there.